Located between 4th and 5th streets on Cargill Way, Burry Park provides an open green space which has been home to such events as the city’s Screen on the Green free movie series. The park was redeveloped from the site of the former Cargill Oil Mill. The Veterans Memorial is dedicated to the veterans who served the United States during the five major conflicts of the 20th century: World War I, World War II, the Korean Conflict, Vietnam and the Persian Gulf War, as well as the five branches of service. The bas relief bronze monuments are clad in architectural cast stone place in a pentagon shape. Each monument is a collage of events with detailed representation of military uniforms, weapons and symbolism of each conflict. On the ground surrounding the memorial black, granite bars separated by bronze medallions feature the branches of the armed services. 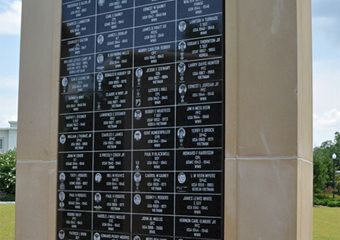 The inside of the pentagon shaped memorial displays black granite plaques honoring 420 veterans who have connections to Darlington County. These plaques show the veteran’s names, branch of service and dates of service. 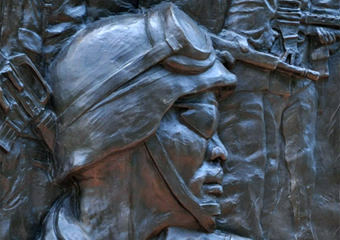 Hartsville native Charlie Pate sculpted the bas relief monuments. He is an honor graduate of Ringling School of Art in Sarasota, Florida. Charlie is the son of Catherine and Gerald Pate of Hartsville. Charlie’s son Charles assisted his father in creating and fitting this structure. The Hartsville Veteran’s Walk, connecting the Veteran’s Memorial to South Fifth Street, is lined with 32 Okame cherry trees.